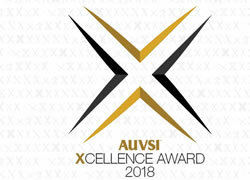 Finalists for the inaugural XCELLENCE Awards by the Association for Unmanned Vehicles Systems International (AUVSI) were named today. They represent accomplishments by companies, organizations and individuals across the unmanned systems community. The winners will be announced during award ceremonies on Tuesday, May 1 and Thursday, May 3, during AUVSI XPONENTIAL 2018 at the Colorado Convention Center in Denver.